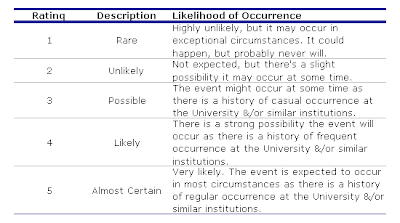 Depending on where you are working you can put likelihood percentages next to these classifications to increase people’s certainty about what they mean. The insurance company Benfield has published this table in presentations as an example. Your bands can be whatever you want, but they help people allocate things into classes and they help people understand what likelihood means. These definitions can also be enhanced by putting timeframes on them; such as within the project lifecycle, within the benefits extraction period, within a year, ten years etc. Again; it’s all in aide of effective communication. The Insurance industry uses historical information and sophisticated models to work out how likely you are to be robbed or die of a heart attack. IT and Business projects are not yet at this stage of sophistication and I am not qualified to speak for the building industry. However, there are many reports and studies published on the internet and elsewhere that show common risks and how frequently they occur. And the number of reports increases each month. You can also look at corporate archives to see what common risks occur where you work. For example is there a risk the deadline is too close and you don’t have time to deliver good quality? Are you the hundredth project in that circumstance where you work? At the end of the day most people today rely upon their personal experience to assess likelihood of a risk eventuating. You should use yours too, but be aware of its limitations. When you get the chance you can search the internet, your companies documents, your colleagues memories and other places for common risk factors and their likelihood of occurring. The wisdom of many can do a great deal to help you avoid risk.